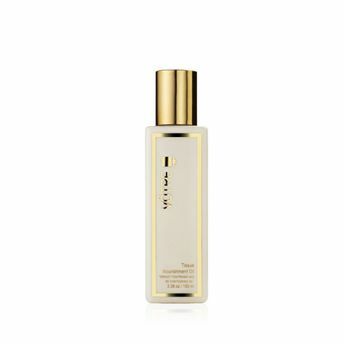 Buy Votre Tissue Nourishment Oil Breast Tightening & Uplifting online in India. What it is: A 100 % safe composition of tightening and firming product that contains intensive lifting a ndfirming complex. Active molecules penetrate deep into the skin to achieve healthy breast line. Regular use recontours and redifines the breasts. The cause of sagging breasts are poor blood circulation, lactation, stress, age cause the weakening of the tissue. The whole collagen matrix is disturbed and deformed, thus giving the bust a loose and sagging appearance. What it does: Effective product with botanical extracts and active containing intensive lifting and firming complex. This active molecule along with the essential oils reaches the tissue and gives them strength and improves the microcirculation. The ingredients give the necessary nourishment and allow perfect contouring and toning of the bust collagen matrix. Suitable for: Normal, oily, combination, sensitive and dry. What else you need to know: 'VOTRE' skincare is Leaping Bunny certified, PETA and vegan certified. Votre provides everyday essentials and targeted skincare solutions that deliver immediate relief, lasting results, and feel-good textures. Their products are formulated with only clean, skin-loving ingredients that are carefully selected so you don't have to worry about what's in (and not in) your skincare products. There are over 1,300 ingredients on Votre's no-no list, including artificial colorants and artificial fragrances, parabens, ethanol, ethyl alcohol, denatured alcohol, methanol, n-butyl alcohol, isopropyl alcohol, sd alcohol, lanolin, propylene glycol, phthalates, mineral oil, petrolatum, formaldehydes, oxybenzone, coal tar, hydroquinone, triclosan, triclocarban, talc, and sulphates. Votre utilize the finest natural ingredients and incorporate advanced scientific technologies to ensure the highest quality and most efficacious formulas without compromise. They are protective of the environment as they maximize the use of renewable, sustainable, and biodegradable ingredients. The brand proudly stands behind the quality, efficacy, and safety of each of their products. What it is formulated WITHOUT: Parabens, sulphates, synthetic fragrances, synthetic dyes, petrochemicals, phthalates, GMOs, triclosan and alcohol. About the Brand: Introducing India's patented bio-cosmetic brand that offers 100% botanical, vegan & cruelty free products. VOTRE is an Indo-Asian brand created by Trumount Cosmoceuticals Pvt Ltd. Born from the collaboration of Asian aesthetics and modern science and technology; VOTRE is where ancient herbal tradition meets botanical science. Inspired by Ayurveda, the herbal healing tradition of India, VOTRE combines ancient beauty rituals and herbal medicinal practices with the best of modern science to create a luxurious and indulgent problem-solution range of skincare and body care products. Researched and developed in association with ace-laboratories in France and Tokyo; VOTRE has always harnessed ingredients both rare and effective, with cutting edge biotechnology and patented molecules and finest botanical extracts, oils and blends. In an increasingly globalised market, where quality and service are the fundamentals to distinction, VOTRE remains faithful to its core values: working only at the highest standards combining innovation with grounded experience. Thanks to the outstanding and pioneering collaborations with top international research centres and accredited laboratories, VOTRE is committed to guarantee market high-end products dedicated to the safety and efficacy with particular care to the natural environment preservation. Certified by PETA an ISO 9001 : 2008 Certified company, all VOTRE products are clinically tested, Dermatological approved and 100% effective and safe!